Assistant manager Greg Abbott says Notts County would be "daft" not to try to re-sign Nottingham Forest defender Louis Laing on loan in January. 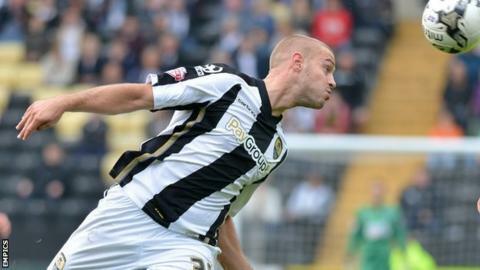 Laing's emergency loan stay at Meadow Lane can not be extended beyond Saturday's match against Swindon Town. The League One side have not lost a match in which the 21-year-old former Sunderland man has featured in since September, winning seven of 11 games. "Louis has been terrific for us," Abbott told BBC Radio Nottingham. "If you are looking forward, and are trying to move the club forward, the younger ones are the ones we like to get in. "He has to go back because his loan is up and he will talk to [Forest manager Stuart Pearce], who will tell him what his plans are for him." Meanwhile, Magpies captain Hayden Mullins is close to returning to action, having only managed to play 37 minutes since 2 September. "His problem is going to be how well the young players have done and getting him into the team," said Abbott. "His experience, nous and quality makes it fantastic for us that he will be available over a really busy challenging period."